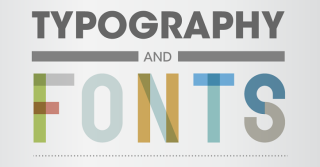 Master the technical terms of the typography industry with this insightful infographic. If there's one area of design that's sure to provoke divisive opinions, it's fonts and typography. Logo designs and rebrands can succeed or fail based on their choice of font, but what is it about typography and wordmarks that gets people so riled up? The answer is that there's a lot more to typography design than meets the eye. In fact there are a range of rules and technical terms relating to the construction and make up of fonts that most people simply don't know about. To help demystify the technical codes surrounding fonts, The Logo Company put together this stylish infographic that clearly explains the alphabet of typography terms. So give it a read, and next time you see a designer complaining about an ugly ball terminal or a scruffy tittle, you'll know what they're talking about. How many of these terms are you familiar with? While some of these terms – the arm, crossbar and stem, for example – could probably be deciphered by themselves with a bit of careful thought, others are more bafflingly named. A font's counter, for example, is nothing to do with how many times something happens, but the open space inside a letter or number. Some of our favourites are 'spur' (because it reminds us of the spurs on a cowboy's boots) and 'tittle' (because it sounds funny). This is a small but helpful selection of the key typography terms, to help demystify it for you. If you'd like more information about these terms, or would like to learn the other type rules and terms (such as what a fleuron is, and why leading is called leading), check out our in-depth guide to Typography rules and terms every designer must know. The glossary of typography within that article is well worth bookmarking.